During 2008 I was making small, ornamental ceramic fountains and putting them around my home. I had one outside on the patio, plugged in and running and found our cat, Bijou, frequently using it. I realized with a start I didn’t think I had ever seen him use his water bowl. A light bulb came on and I wondered, is this a thing – cat water fountains? I went to the computer and typed in ‘cat fountains’ and was shocked to see over six million listings come up. I discovered that feline hydration is a big issue. I learned that many illnesses with which cats are afflicted is because cats tend to not drink enough because they crave moving water. 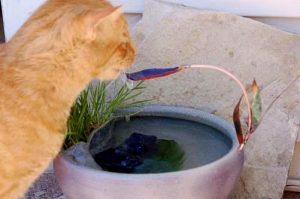 I saw numerous unattractive, plastic, mass-produced cat fountains which were said to cause chin acne in some cats, and I realized that there was a real need for attractive high-quality cat fountains that were also food-safe. We went from a cat water bowl to a cat fountain, and noticed an increase in our cat’s interest in drinking water. Many others have also realized the benefits of a fountain and they are widely recommended by veterinarians. It is now commonly known that in the wild, which cats still very much are, still water, which can harbor countless, lethal bacteria, is unsafe and only moving water is safe. This is why so many cats stir their water or leap onto the counter to have the faucet turned on or go into the shower. They are hard wired to seek moving water. That is why fountains are so effective in preventing illnesses that come from not drinking enough. Water consumption is also a significant part of the cure when they have become ill from insufficient hydration. Learn more about cats water needs, and click here to view our high quality, ceramic cat water fountains.